It was Alison's grim determination that led to her success. The journalists made grim jokes about the situation. War is a grim business. The grim old house stood alone on the hill. The boss was a grim man who rarely smiled. Things have been pretty grim at home since Tom lost his job. 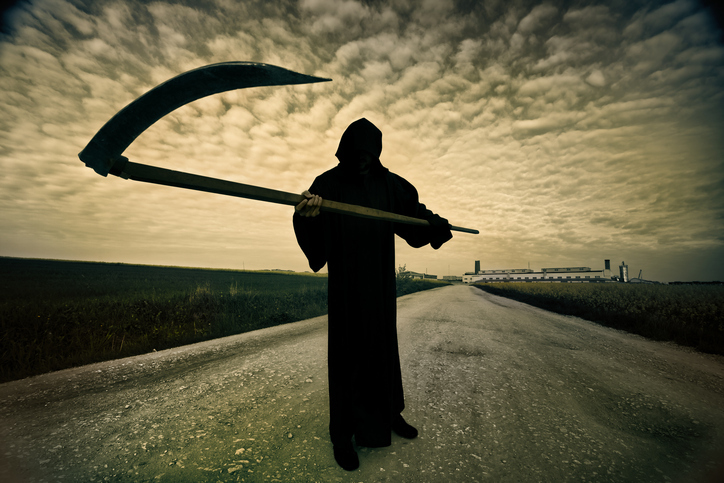 The grim reaper is the personification of death. He is usually depicted as a skeleton wearing a hooded black cloak and carrying a scythe (an old farming implement with a long handle and a sharp curved blade, used for reaping wheat, corn, or other cereal crops by cutting through the stalks). Grim dates back to before the year 900. The Old and Middle English adjective grimm originally meant ‘fierce, cruel or savage’ as well as ‘dire, severe or painful.’ It can be traced back to the Proto-Germanic grimmaz and the Proto-Indo-European root ghrem– (angry). Some linguists believe that it emerged as an imitation of the sound of thunder, but this would be difficult to prove one way or another. It is related to the Old Norse grimmr (grim or angry), the Old Saxon, Old Frisian, Old High German and German grimm (grim, angry or fierce), the Old Norse grimmr (stern, horrible or dire), and the Swedish grym (fierce or furious). The sense ‘dreary or gloomy’ appeared around the 12th century, and is considering a weaker form of the meaning that eventually took over. Grim also had a verb form in Old English, grimman, but this use was lost by the 12th century. The related noun grima, meaning ‘goblin or specter,’ also existed in Old English before the year 900, but fell out of use by the early 12th century. Grim began to be used as a noun to mean ‘specter or ghost’ in the early 17th century, but it is thought that this use emerged because of the influence of another language or even ancient literary texts, and is not directly connected to the older noun.